HierComm Network’s mission is to provide rural communities with reliable, high-speed wireless Internet service that enable local businesses, residents, telecommuters to fully leverage the latest Internet and communication technologies for their work, study and play. Our fast, strong network performance has drawn large portions of un-served or underserved communities to switch from dial-up, satellite and other wireless providers. 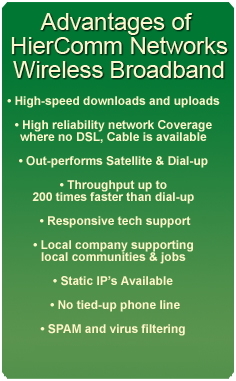 HierComm Network's residential, business, school and non-profit services offer a true wireless broadband Internet connection, with standard plans up to 10 Mbps and custom plans above this. Voice, Video (Netflix, HuLu), Audio (Pandora, Spotify), gaming and everyday surfing (Google,Bing) and email are easily and quickly transported across our network. Once you have a true Broadband Internet connection you will realize what a high speed connection to the Internet has to offer!